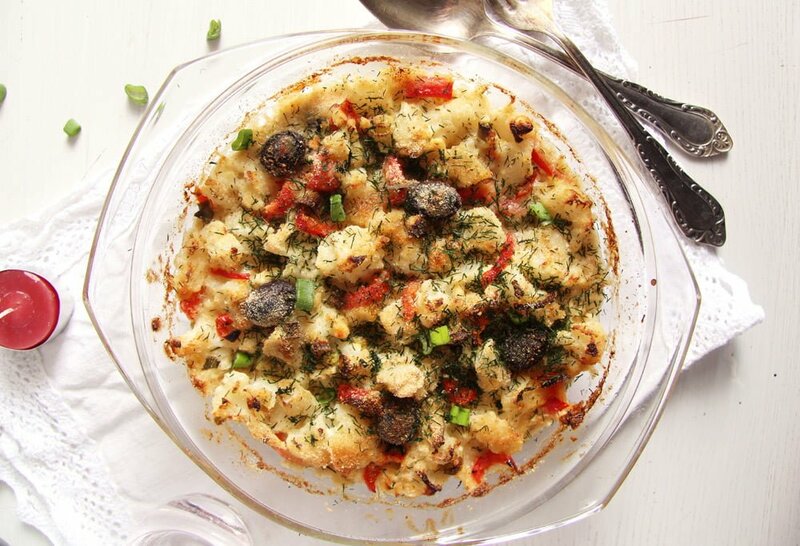 A light and fresh recipe for cauliflower casserole with feta cheese sauce, peppers and olives. Another cauliflower casserole today. 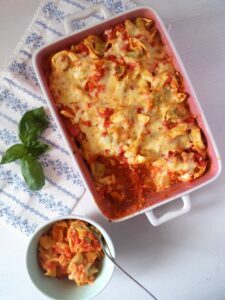 After the Turkey Meatballs and Cauliflower Casserole from Tuesday, I felt I should give you the recipe for a casserole more suitable for the spring almost summer weather we have been enjoying for the past days. 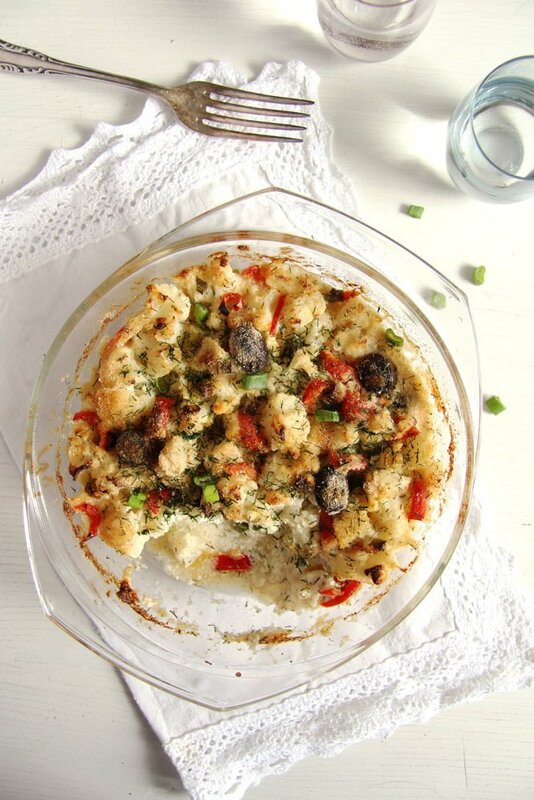 Cauliflower plays the main role again, but this time it is accompanied not by meat but by peppers, scallions and olives, all baked in a salty and delicious feta cheese sauce. 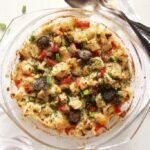 This Cauliflower Feta Casserole is an easy and quite quick recipe, perfect for a late summer night. I can imagine eating this in the garden with just a piece of baguette on the side and a nice glass of red wine. Simplicity at its best, I would say, a sentence that often describes the way Romanian people cook. 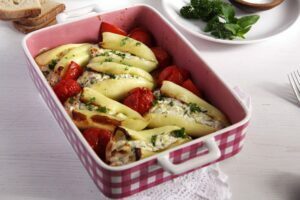 Fresh, seasonal produce combined with other typical Romanian produce like telemea, a Romanian white cheese made of sheep’s or cow’s milk, very similar to feta cheese. But until then I will keep making this Cauliflower Feta Casserole and many other dishes containing feta like this Polenta Pizza, this Tortellini Salad or these Roasted Green Onions on Creamy Polenta with the regular feta cheese I can buy around here. Preheat the oven to 180 degrees Celsius/ 360 degrees Fahrenheit. Butter a small casserole dish with about a third of the butter and sprinkle it evenly with 1 tablespoon of the breadcrumbs. Divide the cauliflower into small florets and chop the stem into small cubes. Bring a pot of water to a boil, add some salt and the cauliflower. Bring to a boil again and let cook for about 5 minutes or until al dente. Drain well. In the meantime quarter the bell pepper and slice the quarters thinly. Slice the scallions into thin rings. 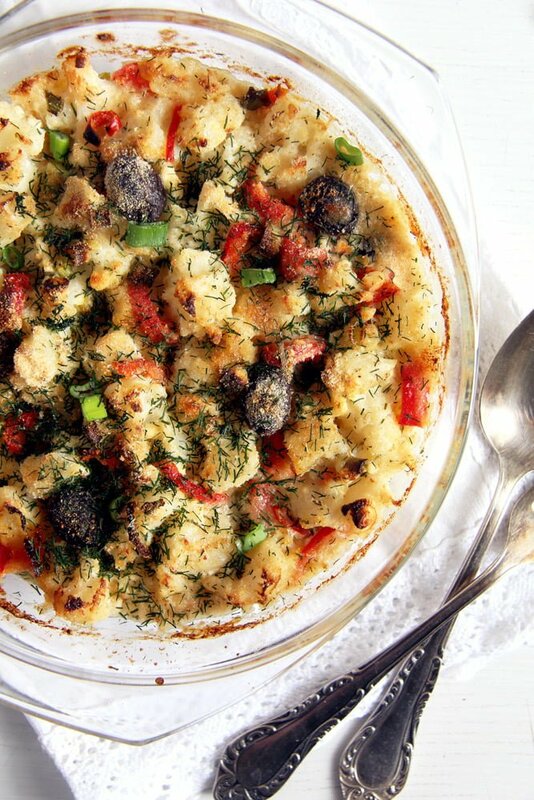 Give the vegetables and the olives to the drained cauliflower and mix carefully. Transfer the vegetables to the prepared casserole dish. Crumble the feta cheese in a small bowl. Add the smetana, milk, dill and salt and pepper to taste. Mix well and pour over the vegetables. Mix carefully and sprinkle everything with the remaining ½ tablespoon dry breadcrumbs. Dot with the remaining butter and bake for about 25-30 minutes or until heated through and golden. 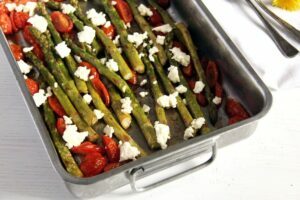 Serve with baguette and red wine. This looks so delicious! 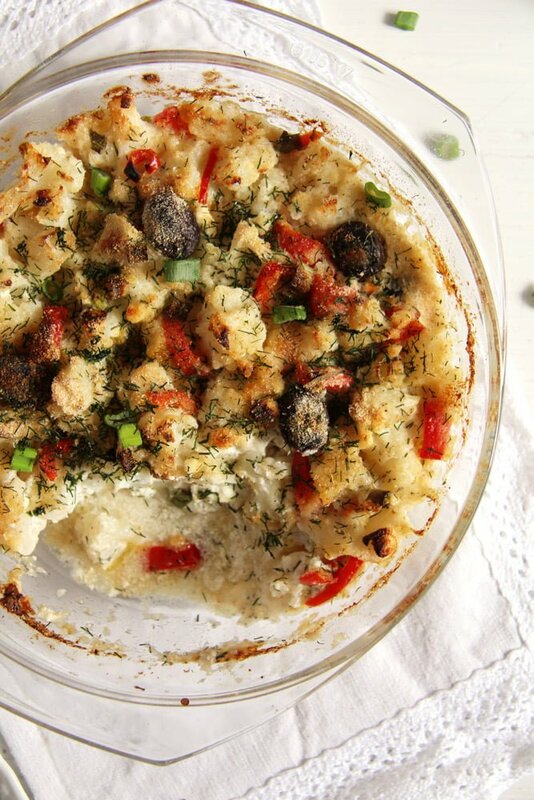 I love both feta and cauliflower and this recipe seems easy to prepare too. Thanks, Adina. You could mix some cream cheese with a bit of milk to make it slightly thinner and use that mixture instead of creme fraiche. Seems like a finger-licking dish, Adina! Can’t wait to try it! Your cauliflower series are amazing!!! as expected!